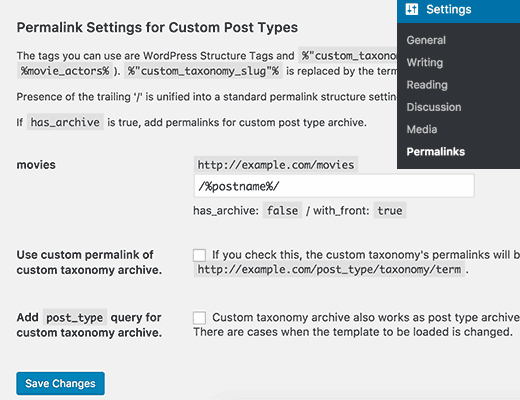 Recently, one of our readers asked if it was possible to change the custom post type permalink structure in WordPress. 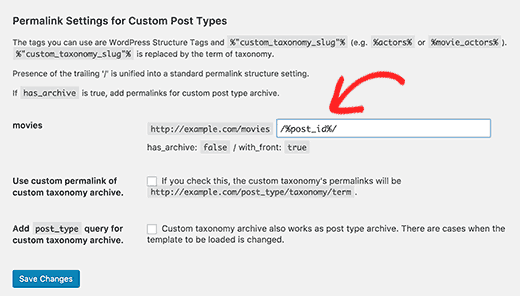 By default, you can change the permalink structure of WordPress posts, but not custom post types. 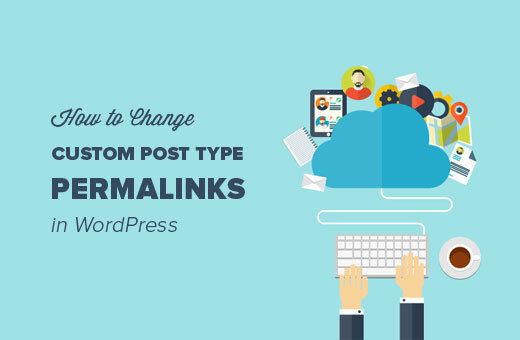 In this article, we will show you how to change custom post type permalinks in WordPress. 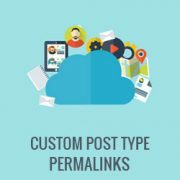 Why Change Custom Post Type Permalinks in WordPress? WordPress uses SEO friendly URL structure which makes your WordPress URLs readable and search engine friendly. These SEO friendly URLs are called permalinks. 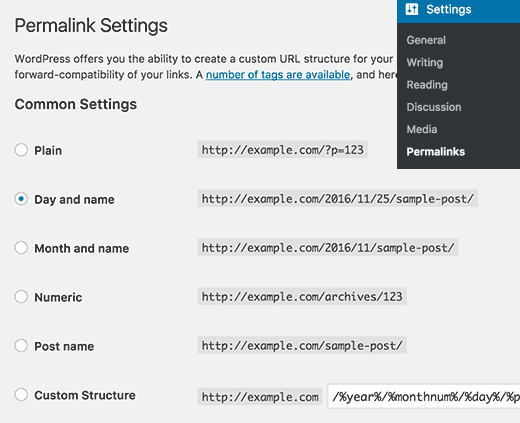 You can customize permalinks by visiting Settings » Permalinks page. However, you will notice that you can only change permalink structure for blog posts. If you are using custom post types or custom taxonomies on your website, then WordPress will use default permalink structure for those. This URL scheme is quite SEO friendly and in most cases you don’t need to change it. However, sometimes you may want to customize it to meet your own needs. Having said that, let’s see how you can easily customize custom post type permalink structure in WordPress. First thing you need to do is install and activate the Custom Post Type Permalinks plugin. For more details, see our step by step guide on how to install a WordPress plugin. Upon activation, you need to visit Settings » Permalinks page and scroll down to ‘Permalink Settings for Custom Post Types’ section. Here you can change the permalink structure of single items in your custom post type. You can use all the standard WordPress permalink tags. For a complete list of available tags, see our article on using SEO friendly URL structure in WordPress. Notice the trailing slashes at the beginning and end of the tag. These trailing slashes are the separators, and without them your permalinks will not work. The number in the URL will be the numeric ID of the post in your WordPress database. Click on the save changes button to update your permalinks. So far so good. Now let’s try another example. In this example, genre is the slug of our custom taxonomy. That’s all, we hope this article helped you learn how to easily change custom post type permalinks in WordPress. You may also want to see our list of 12 most useful WordPress custom post types tutorials. I am using custom-post-type-ui for custom post and “With Front” property is set to false. But still not working fine. this post is very helpful to learn about custom post…………thanks for posting…. how do I get a list of posts custome post type in which will be in place at the end of the article on the type of regular post? who only took the post whose title is almost as usual on the post? Get Godaddy Managed WordPress Hosting for $1 per month and a Free Domain.